Ultrasound-guided biopsies are performed in the doctor’s office. Tissue sampling (biopsy) is done on an outpatient basis. It is a minimally invasive examination in which – under local anesthesia – a specific piece of tissue is taken from the breast. The removed piece of breast tissue is no larger than a few millimeters. The pathologist then assesses the tissue sample and can either exclude or confirm the diagnosis of cancer. Tissue sampling is always image-guided (with the help of mammography, ultrasound or under MRI control) so that accuracy is 100%. Image-guided means under sonographic, mammographic or MRI control. 100% accuracy means that only the tissue is sampled, which is noticeable in the imaging. In my office, only ultrasound-guided biopsies are performed on site. 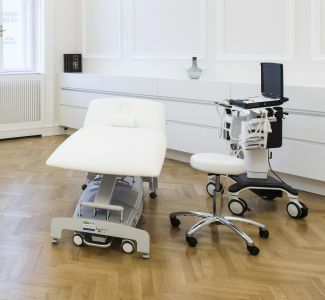 The stereotactic (mammographic) or MRI-guided biopsies are performed in cooperation with hospitals such as the AKH, The Döbling Private Hospital or Hera, where I am also active. The histological evaluations are performed in the laboratory Kaserer, Salzer & Beer OG, by Dr. Franz Beer. Just as important as proper tissue sampling is the correct interpretation of the histological results. The discussion and explanation of histology are part of the overall concept of my medical practice. The top priority is to carry out the diagnostics completely and to the end. With the final diagnosis, the woman will be handed over to the respective colleague for further care and therapy. It is very important that tissue sampling is only performed by experts! Incorrect procedure can unnecessarily delay the correct diagnosis. Dr. Bernathova took a lot of time to explain everything to me first. Throughout the examination she informed me about what would happen next. That was a great relief for me.